Rock ‘n’ roll was – for the most part anyway – far more demanding when it came to its source material than other musical genres. One look at the Pop Music Charts of June 1949 when this record came out should confirm this as there were just fifteen song titles in the thirty best selling records of the week. That meant on average each song had two versions selling in huge quantities. In fact there were three versions of the #1 song, four of the #2 song, three of the #3 entry (and even two versions of its flip side in the Top 30!) which all resided in the charts for the second week in June. Amazingly Perry Como, Bing Crosby and Frank Sinatra all released IDENTICAL records, the same A-side backed with the same B-side! But that was the way it went. Singers weren’t songwriters and the record industry wasn’t very honorable to begin with and so everybody grabbed each and every song that showed promise, original source material be damned. It was the same in other fields. Blues and gospel recycled songs at every turn. Sometimes it seemed as if each style had but a dozen or so songs, all of which were cut by every artist for twenty or thirty years running. Meanwhile even the most innovative jazz bands all played the same songs, maybe using different arrangements, but they each had a “book” they carried with them that had the exact same titles as every other band. If two bands were riding the same train and had their luggage mixed up they likely wouldn’t even realize it until their bandstand gig the next night was more than half over because their set-lists would be the same! But rock ‘n’ roll changed that for the most part simply because that style wasn’t suited to performing those types of interchangeable songs. Their audiences demanded originality and craved something crafted to suit their specific needs and to reflect their unique cultural viewpoint, played in a way that excited them rather than put them to sleep. As a result rock artists’ source material wasn’t moldy standards or gimmicky novelties… unless of course they were on a major label who viewed all music as mere “product”, as if it were soup, soap or sourballs. You have to wonder whether Chris Powell and The Five Blue Flames viewed being signed by the oldest and most venerable record label in existence as an unprecedented opportunity… or an unbelievable headache, at least when it came to trying to craft their own image in a marketplace that was very exacting in their requirements for inclusion. A Philadelphia club band couldn’t be choosy however, not when Columbia and their prestige came calling seeking a group to help break the label into the increasingly lucrative rock market. So, surely promised fame and glory if they agreed, Powell and company jumped at the offer, even if it meant they’d be at risk for meddling executives who neither understood nor appreciated the type of music they were trying to play. When this, the group’s first record, came out they found out for themselves what kind of tepid ideas Columbia had for them as the company paired two novelty songs together, hoping that the silly enthusiasm these songs showed would be… well let’s say spirited enough to fool rock audiences into embracing them while at the same time would be harmless enough in their intent to not lead to open revolt in their shareholders, their normal clientele and in society as a whole, as surely they’d feared had they let Powell release something more authentic. 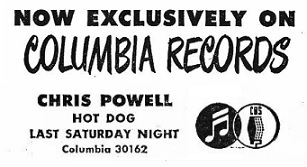 And so for all of Powell’s grand ambitions (presumably) about achieving rock stardom he found himself reduced to singing about a Hot Dog on one side and for the flip side it was a song about cabbage of all things, on Last Saturday Night. Needless to say, up to the minute appropriate source material for rock ‘n’ roll hits these were not. Chances are if you’ve listened to music made last century you’ve heard this tune somewhere. Or if you listened to music from the century before THAT – the 1800’s – you’ve heard it as well. But what name you heard it under is another story. In England, where it originated, it’s called Seven Drunken Nights and regardless of its long and colorful lineage across the pond it is doubtful that Columbia Records would’ve conceded calling it THAT when promoting a new group in a style that was already at risk for being seen as comprised of a bunch of drunken bums masquerading as musicians. 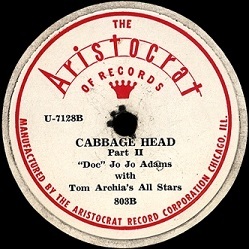 In America it took on different names, most recently Cabbage Head by a singer we met in passing in March 1948, one Dr. Jo Jo Adams, who appeared as the featured vocalist on a song credited to saxophonist Tom Archia called If I Feel Like This Tomorrow. Their subsequent record from August of ’48 was this one. But while Adams’s work on the cut from March qualified for rock (just barely), the follow-up did not. Yet here that song is now under the rock umbrella by a different group. So what gives? Well this song, whatever you called it, was basically just a comedy skit set to music and so whatever music accompanied it would ultimately determine its categorization for the most part. In all takes on it, from jazz to blues to pop, the basic structure, musical and otherwise, remained essentially the same, but you could make adjustments depending on the pace and instrumentation used to highlight different aspects of it. Adams had chosen to emphasize the stand-up comedy routine angle, something which was no doubt inspired by the previous year’s runaway success of Open The Door, Richard which had been the song of the year in all of its many renditions. As such Adams “sang” this in a semi-spoken tone delivered in excessively drawn-out fashion while backed by Archia’s mild uninspiring jazz-lite playing, all of which was stretched out over TWO sides spanning more than five minutes of ponderous listening. The jokes were still intact but the rhythm that all jokes need to put across the humor was totally stripped by the agonizingly slow pace. It almost seemed as if you’d have to wait until the next day for each punchline to be delivered along with the morning paper and the jokes were never worth the wait, especially when the gist of them all was the same. Powell and company improve greatly on that approach here merely by speeding it up, putting across the same story in half the time and surrounding it with music delivered with a shot of adrenaline to keep things jumping. But whether that turns a 19th century routine meant for drunken Irishmen and Brits into a prospective jukebox favorite for kids just barely approaching drinking age in mid-Twentieth Century America is another story entirely. The musical framework here, as stated, is the same but taken in double time. The piano that kicks it off is spry and positively restless compared to anything Archia’s crew laid down. It’s buttressed by someone shouting encouragement from the sidelines which sounds genuinely excited to get this off the ground. Unfortunately they can’t quite keep that spirit up as Last Saturday Night goes along largely because the lyrical framework is so awkward that it’s difficult for the two to ever work in tandem. It CAN be done in theory I suppose, but the fact is Powell speeds his vocals up TOO much, barely able to keep a grip on the melody in the process. The music then tries to keep up, or catch up even at times, and they’re never fully in sync. If Adams was traveling along at 25 MPH on his rendition of the song, Powell is racing the motor of this version at about 105 MPH. One is blocking traffic, the other about to get a speeding ticket. Had he kept it in third gear and taken this at 55 MPH the song might’ve worked a whole lot better because the story is actually pretty clever and fairly funny, even if it’s the same basic joke repeated ad nauseum about a drunken man arriving home one night and finding all sorts of suspicious “things” wherever he looks, on the hat-rack, in his bed, under the bed… which indicates that his wife been sleeping with another guy while he’s out drinking. 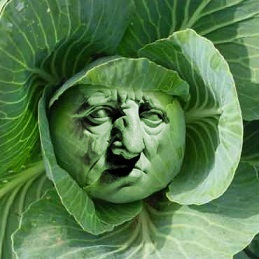 She’s got an excuse for each of the items he points out, including the head on his pillow being a cabbage, all of which are absolutely ludicrous, but in his drunken condition they might be plausibly believable. He doubts they are, raising more questions in the process which are in fact the punchlines to each scenario – the fact he’s never seen a hat band on a frying pan, which for some inexplicable reason is hanging on the hat-rack when he walks in his front door for instance. They’re humorous, if not exactly laugh out loud funny, and that’s the bigger problem. When confined to a song they need a melodic lead-in to sell those jokes and that lead-in remains the same each time – “I’ve traveled this world for many a mile and I hope to travel some more/but I’ve never seen…” and then the joke. Though sung as well as can be expected by Powell, it saps the momentum. You know the skit after one pass and each time it’s repeated it gets met with diminished expectations and thus less hardy laughs. Too much time goes by between the set-up and the actual zinger for it to hold up and when you toss in the refrain that follows each “chorus” – the “I said Mama/Hey pretty baby…” lines which act as a vocal bridge – it further derails the proceedings even though when taken alone that’s the best aspect of the vocal arrangement. The musical components are at least played with the appropriate rapid-fire pace and a dash of whimsy to try and sell the humor a bit more, but aside from Danny Turner’s reasonably strong sax solo nothing really about it stands out on its own because it gets steamrolled by the frantic nature of the whole affair and as a result it takes all the nimble stepping it can muster to not trip over the vocal lines. You have to give them all some credit for managing to drag this ancient carcass into the rock neighborhood, but it’s still painfully obvious that Last Saturday Night was Columbia Records’ misguided concept of what might pass as rock ‘n’ roll rather than a serious effort to actually come up with something legitimately appropriate for positioning them as contenders in this field. It’s too bad Chris Powell and his cohorts had so little to work with on both sides of their debut because in each case they do more with these conceptual brain cramps than anyone had the right to expect. But that’s little consolation for the group itself who now – if any actual rock fans were made aware of these, which is hardly a sure thing – would have to fight against the impression that they were a novelty jive group of some sort rather than genuine rock artists with something vital to contribute. Of course the oddest thing about this was the source material – which was so wrong for rock ‘n’ roll – was actually pretty good for their previous gig as a club act, provided they dialed back the music and singing and delivered this as a straightforward comedy routine in between sets. You could highlight the jokes with some musical riffs, but stripping the melodic contrivances it’s stuck with here would allow it to work as a skit with an adult audience out for a good time who were more attuned to this sort of thing. But for those who were expecting a record of Last Saturday Night to deliver either laughs or musical fulfillment when sandwiched between the latest sides by Wild Bill Moore and Big Jay McNeely, this was going to be an awful let-down on a Saturday night… or any night of the week for that matter. 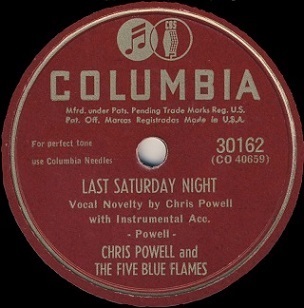 Leave a reply on "Chris Powell And The Five Blue Flames: “Last Saturday Night”"